The Panasonic KX-DT333AL digital phone is the entry level model in the Panasonic DT300 digital series. The next model up is the KX-T346AL. Fundamentally they are identical in appearance and the only two differences are the KX-DT346AL has a 6 line display (vs. 3 line) and a blacklit screen. The backlit screen is a definite positive because it makes the screen much easier to view in all lighting conditions. Also by having the larger display it facilitates easier control of the systems features and navigation. For most users the KX-DT333AL is more than adequate but you will want to see them first hand for yourself to compare. The KX-DT333AL is designed for executives and managers with the 24 programmable buttons. If you need more buttons you can simply add the Panasonic KX-DT390AL 60 DSS Console which gives you an extra 60 programmable buttons at a glance. The KX-DT333AL handsets 24 programmable buttons are accompanied by green/red multicolour LED status indicator lights. This makes it easy to see clearly and quickly if staff are available or not before you call by the colour status (presence) shown. Silver Jog Dial for Fast Access to Directories, Phone Logs, Redials and more. At the bottom right of the KX-DT333AL phone you'll also notice a round silver jog dial. The multidirectional navigator, and the accompanying button, makes it much easier and quicker for staff to access speed dials, directory dials, incoming/outgoing call logs and other Panasonic phone system features. It's a great feature to have for heavy phone users. The Panasonic KX-DT333AL telephone also comes in a choice of two colours to suit most office applications - black and white. Very few handsets offer colour selections beyond that and you'll typically find them in more expensive offerings. Just keep in mind that over time the white handsets, like cars, will show the dirt easier and will need to be kept clean. The three line 24 character display is more than adequate and what you'd expect to find on a handset at this price point. The KX-DT333AL has moved beyond the traditional handset design and now offers 4 context sensitive keys. These are the buttons directly below the screen. These buttons change options depending on which system functions and features you are using. They are designed to be intuitive and generally make daily handset use easier. For example, if you aren't using the phone you'll see options like program, info, ring and menu - these are the most logical starting options when dormant. If you're accessing the KX-DT333AL's voicemail you'll see options like replay, delete etc. Beyond that, digital handsets like the KX-DT333AL phone are a smarter, cheaper alternative for most workers. Don't forget that the Panasonic TDA30AL, TDE200, TDE600, NCP500 and NCP1000 office phone systems allow you to mix and match ANY combination of Panasonic IP, Digital, Wireless or Analogue handsets. 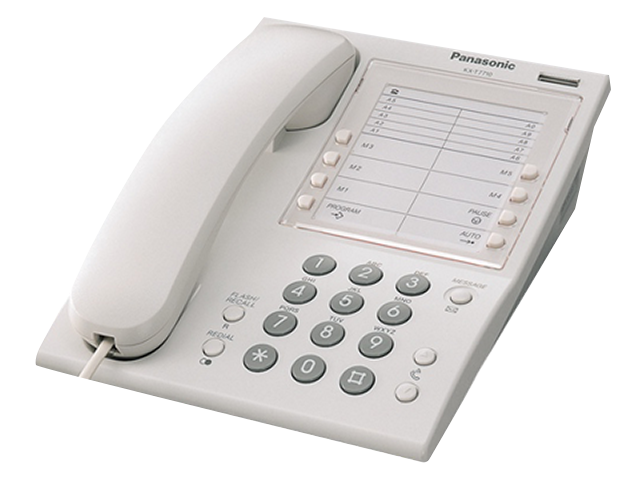 If you're looking for an equivalent level VoIP (IP) phone then you should check out the identical basic Panasonic KX-NT343X IP handset. Below you will find the speciation's for the KX-DT333AL digital phone. Infiniti telecommunications is not affiliated with the manufacturer of this product in any way. Looking to learn more about Panasonic KX-T7710AL analogue phone (basic)?